We had 2 late teams added to the schedule, making the teams in each division an equal 14. Each team has received an additional 6 levels to use, making the total for the season 14x6=84 levels. Please check your match schedules to make sure you know when your matches are, as there are no more bye weeks. If you have any questions, please contact Sweegy Manilow. Each player has received 78 levels for the season to spend as they see fit. If you don't see a match for your team immediately, your team may have a bye week. The first matches must be completed by the end of Sunday, March 10th. The results of those matches will be posted Monday. Good luck to all teams this season! Last Day to Register Sunday! Be sure to register and finalize your teams by Sunday! If you have any questions or problems, please contact Sweegy Manilow. TFL Season 7 Registration is Open! TFL Registration is now open in Alston! Registration is $500 per person and will end Sunday, March 3rd. Feel free to take a copy of the TFL info board next to the registration vendor, it will update with TFL scores and news weekly! 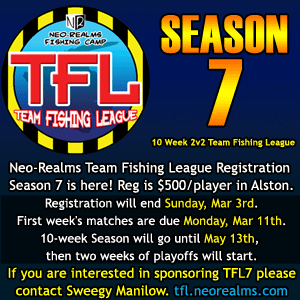 The Neo-Realms Team Fishing League (TFL) is a competitive, team-based tournament league for Neo-Realms Fishing. Players compete in 2v2 matches over the course of a season, with over $25,000L in prizes going to the top teams and league victors. Grab a partner and register today! TFL Season 7 Registration will open up on Monday, February 11th! in Alston. If you would like to sponsor the TFL league, please contact Sweegy Manilow.